By Greenito on	 March 19, 2016 Did You Know? Recreational marijuana is the fastest-growing industry in the United States today, expected to bring in $4.5 billion this year alone. So why are we still buying cannabis with cash, like it’s 1916 instead of 2016? The short answer: Because even in states where it’s 100% legal, marijuana businesses are not allowed to have a bank account under federal law. When a business can’t set up a bank account, it can’t accept credit cards. It can’t set up automatic paychecks for employees. It can’t even pay its taxes easily. According to Taylor West of the National Cannabis Industry Association, the lack of access to basic financial services is “the biggest problem we have” in the marijuana business. Luckily, some Members of Congress are already trying to fix this problem through a piece of legislation called H.R. 2076, the Marijuana Businesses Access to Banking Act. H.R. 2076 is supported by 34 Representatives and 11 Senators from both sides of the aisle. That’s a good start, but it’s not enough. We need more supporters in Congress if the marijuana industry wants to move into the 21st century. That’s where we can help make a difference. Click here to find out who your Senators and Representatives are. 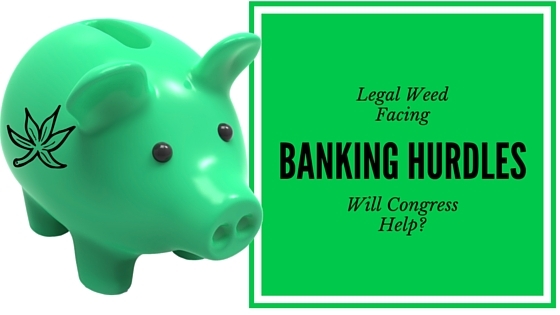 Give them a call and urge them to co-sponsor the Marijuana Businesses Access to Banking Act today! Live in a place where its legal? Find the best deals and dispensaries here (make sure to bring cash! ).